Mindfulness is an essential part of mental health in that it is the very skill we need in order to produce change. Mindfulness of how we can do better, our thoughts, emotions, behaviors, sensations, our health, etc give us the ability to first be aware of our limitations, accept areas of growth, and finally make long lasting changes. Here are four tips on how to be more mindful in your daily life. Mindfulness Tip #1: Do more of what you need. Check out Dr. Shauna Shapiro's Ted Talk on The Power of Mindfulness. 1) Observe with your senses. 2) Describe without labeling or categorizing. Practice these skills with the mindful breathing activity provided on the photo above. Let us know how you did in our comment section below. Mindfulness Tip #3: Be in the here and now. We often get caught up with future duties and past mistakes, we then lose touch of the present moment. What we have is now. Savor it. 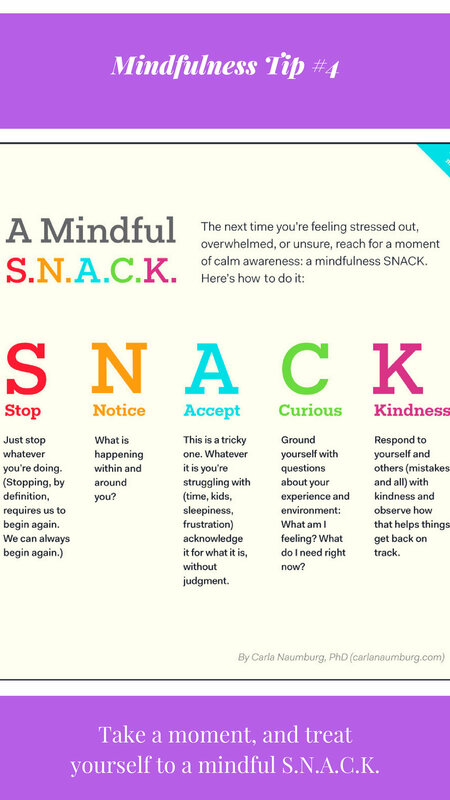 Mindfulness Tip #4: Have a mindful SNACK: Stop, Notice, Accept, be Curious, be Kind. Use this acronym as a grounding technique when things feel out of control. Stop and take a moment. Notice your sensations and refocus. Accept the emotions and challenge. Be curious and kind rather than judgmental and critical. Now you have four useful mindfulness tools on how to live a more conscious and fulfilling life. Thank you for stopping by and we hope to see you soon!